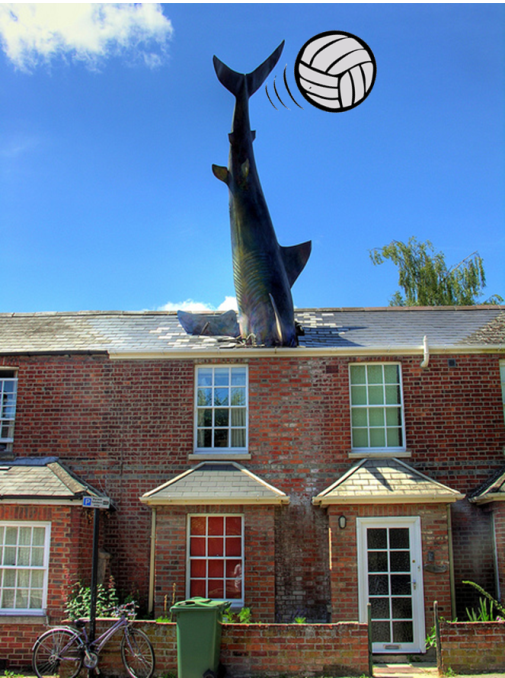 Oxford Volleyball Club: Another win for the Sharks, firmly on top! Another win for the Sharks, firmly on top! Once upon a time there was a Colombian, a German, an American, an English, an Italian and a Filipino playing for the Oxford Sharks. The team headed to Reading last Sunday morning to face Maidenhead 2 and play a friendly match against Spikeos 1. The formation was composed of Felipe as setter, Helen and Tomas as middles, Karina as opposite and Stefano and Caroline as outsides. Despite the early morning wake-up call, the first set against Maidenhead went really well for the Sharks who played organized and consistent. Good covers, solid attacks, strong serves from Caroline and very nice sets from Felipe who had to make up for leaving our mascot Headington at home. 25-10 was the final score of the first set. During the second set, however, people started going back to bed and too many errors let Maidenhead win the set 25-18. During the tie break we made up our mind and, after a point-to-point start, we took the lead and finished the set 15-8. MVP of the match was Stefano. Due to timing issues, the friendly match against Spikeos finished with a draw and one set each. In summary, a good Sunday for the Sharks who are still on top of the league. P.S. Andrey, you can stay in Cisco… we have Caroline! Webmaster's note: Andrey, the Sharks also volunteered you to pay Caroline's match fees!